A test for detergent reactivity? A brief history of cleaning products — when is “soap” not soap? THE WORD “SOAP” MEANS ABSOLUTELY NOTHING ON THE FRONT LABEL OF A PRODUCT. READ INGREDIENTS LABELS. Don’t assume anything is detergent-free unless you’ve removed the detergent yourself (with soap). Wet contact with detergents is a more serious problem than dry contact. Infected patches usually have to be treated before they will go away. Step 1: Get a good vacuum. Seriously. Step 2: Superwash the laundry. Soaps/detergents and flame retardant properties of fabrics. Step 3: Wash all household surfaces with soap and rinse well. Step 4: Wash all dishes, pots, pans, utensils, and other food preparation gear with soap or in the dishwasher with (true) non-detergent dishwashing powder. Step 5: Make bath time an eczema-removal time. Step 6: Remove or reduce detergents from processed food sources. Step 7: Maintain a detergent-free home. Note (May 2014): While the environmental strategies and empirical knowledge outlined here have not changed, over time my understanding of this issue has evolved. (Read more news on the SolveEczema blog.) The most up-to-date overviewof the information can be found in the slideshow video linked to from the home page of this site. My apologies, it's a simple effort - I am not a media person - runs about 45 minutes and has only about 6 slides. It was created for my crowdfunding effort a few years ago to jumpstart efforts to write a book. I will be updating the website when the book is finished. I am also trying to write about the site more technically from the standpoint of "open source" medicine. Until then, watching the slideshow is useful for understanding the website before reading it. ECZEMA OUTBREAKS ARE NOT RANDOM. Eczema outbreaks are not random. They follow logical rules. The problem can be solved, so long as one is able to discern those rules. One or more of the common substances in your home and outdoor environments that you or your child is touching, eating, and possibly inhaling, is causing the eczema and you can track it down. Through this approach, we were able to completely eliminate our son’s breakouts without steroids or any other medication. Please remember that I am not a doctor or health care professional. I am just another parent trying to share what helped us track down the cause of our son’s eczema. Please read my disclaimer, use your judgment, respect your individual sensitivities, and consult your own doctor as often as necessary. Why I didn’t just wait for my child to outgrow the eczema. It’s hard to talk to anyone about infantile eczema without someone suggesting the baby might outgrow it. Personally, I couldn’t see waiting helplessly hoping this might happen. My infant son’s eczema was so severe, it began affecting his development. He couldn’t sleep, his mood, personality, and behavior changed. The broken skin became infected easily. To my husband and me, finding the cause was a matter of urgency. Although doing the detective work and eliminating the cause from our home has required a lot of work, NOT eliminating the eczema seemed far more labor intensive and detrimental. The unpredictable and often serious medical, social, personal, and emotional aspects of dealing with such severe, ongoing eczema were, to us, far more time- and energy-consuming. It made such a huge difference emotionally to all of us to find the key that made the outbreaks predictable and allowed us to clear our son’s skin completely. After a long discussion with our pediatrician and a pediatric nutritionist, as well as additional reading, I also felt that even if my son did “grow out of it,” my efforts to eliminate the cause of the eczema might mitigate future asthma symptoms. It seemed that there was no reason to believe the eczema would likely go away on its own anyway. “Scientists estimate that 65 percent of patients develop eczema skin symptoms in the first year of life, and 90 percent develop eczema symptoms before the age of 5. Roughly 60 percent of these infants continue to have one or more symptoms of atopic dermatitis into adulthood. This means that more than 15 million people in the United States have symptoms of the disease. Eczema and asthma cases have soared in recent years, and no one really knows why. In our modern world, we are exposed to thousands of new substances that didn’t exist at all 20, 50, 100 years ago. My son wouldn’t have had eczema 90 years ago, because synthetic detergents didn’t exist on the planet. Their use has skyrocketed since the ‘70s especially. So, when people ask if I think my son will outgrow his allergy, I have to answer that there is no basis to know, because the presence of such high levels of detergents on our persons and in home environments is so new. The same is probably true for other allergens like latex. I read recently in Science News that two common plasticizers, the residues of which are commonly found in household dust in western countries, have been linked to allergy and asthma. These weren’t nearly so common 30 years ago, if they had been invented at all. Over time, it has also become clear that the reaction is not a simple allergic reaction or irritation, and that the environmental changes we made to help our son also helped everyone in the household, and helps in other beneficial ways we didn't expect. Past experience as to whether children will outgrow eczema is probably misleading. My guess is that as eczema rates continue to rise, the percentage of children that continue to have symptoms into adulthood (the percentage that don’t outgrow it) will also rise. Studies looking at whether breastfeeding is preventative for allergies and eczema, for example, are now concluding that breastfeeding doesn't prevent alleryg and eczemy, as if the previous studies showing that breastfeeding did help were wrong. I think it's more likely both current and previous studies reflect accurately the existing environmental conditions of the time. Maintaining our son’s clear skin has been less work than removing detergent sources at the start. The above researchers found that if they looked at the ceramide profiles of both "lesional involved" as well as the “normal-appearing uninvolved” skin, the uninvolved skin was just like healthy normal skin. There are other similar lines of inquiry in the literature, which in my opinion point more strongly to an environmental cause of virtually all eczema than anything else, i.e., the eczema results from something AFFECTING the skin rather than something ABOUT the skin. Certainly, skin type is an issue — some people seem more susceptible to the effects of detergents and other causes of eczema. Since genes determine skin type, it would be possible to make genetic correlations. But in that case, correlation does not mean causality. If skin type makes one more susceptible to eczema from products that were only invented in the last century, that in my opinion is a failing in the design of these products that are not safe for all skin types, not a defect in people with more affected skin types. _top_ Eczema breakouts follow logical rules, the trick is seeing them. Eczema breakouts can seem maddeningly random. It would have been very easy for us to believe that the solution would never be obvious, obscured by the complexity of the human body or the mystery of some complicated genetic defect. At least I could quickly see that trying this and trying that, thinking the cause was too elusive to track down, was leading more to frustration than solutions. That has also been the case for other parents I have tried to help. The least successful haven’t put in any less work — in fact, often they put in more — but the efforts were unfocused, as if somehow solving such a problem is a game of chance rather than a mystery to solve by logical steps and persistence. It is easy for even very educated people to begin behaving in an almost superstitious manner, trying this product and that product, and avoiding all the unknown and unseen exposures in a random and desperate way. I see over and over again how parents solve their children's eczema — from this and other causes — when they accept that the problem isn't random, and that the breakouts really are directly related to concrete and proportional exposures. Figuring out what those are is of course the difficult part, because of how complicated the environmental exposures can be. Detergents in dust (which can adhere to the skin), for example, cause a whole set of unseen exposures, complicated by the nonlinear effect in the presence of small amounts of water (such as sweating). It is easy, too, to become a slave to addressing the “triggers” rather than getting to the true cause. Dryness, for example, is often called both a “cause” and a “trigger” for eczema. The CAUSE of our son’s eczema was detergent, dryness was a trigger. Every winter, when the heat comes on and dries out the air, our son’s skin becomes more susceptible to breakouts from lower levels of detergent exposure. But absent the detergents, his skin can be very dry with no eczema. With detergent exposure, we can moisturize our hearts out, and it might help, but we have to keep at it and keep at it, and still it won’t make the eczema go away. Exposure to pollen has worked the same way. When our son is exposed to oak tree pollen — which gives him the usual respiratory symptoms — he then breaks out from lower levels of detergent exposure. But absent any detergent exposure, the pollens don’t seem to cause him eczema. The same is true with mold exposure. According to the World Health Organization, "atopic and allergic people are particularly susceptible to biological and chemical agents in damp indoor environments" where molds especially are abundant. (See the WHO Guidelines for Indoor Air Quality - Dampness and Mould) We have seen our son's eczema completely resolve until he spends time in moldier indoor environments, where he becomes more susceptible to outbreaks from contact, and the typical areas of eczema that he gets from ingestion sources sprout up — and go away if we are laboriously fastidious about the detergents, or just get away from that environment and those exposures. I have heard a good analogy for allergy as a bucket — exposure to different things we are allergic to fills the bucket. We experience symptoms when the bucket is filled to overflowing. If the bucket is always close to overflowing because of a lot of exposure to one allergen, then even small exposures to that allergen or to other things we might otherwise tolerate cause the bucket to overflow. But if we are able to keep the bucket relatively empty by avoiding enough of the thing or things to which we are most allergic, then we may be able to tolerate occasional exposures without problems. As I point out in my letter, the advice in Touchpoints helped us figure out the cause of our son’s eczema. The chapter on Allergies is worth reading: while the chapter is fairly compact, the advice and perspective are unique among parenting books and consistent with my own experience with allergy. I recommend reading through the chapter two or three times to start, and again as necessary. The general allergy prevention approach will help some to “empty the bucket” to allow a more clear stage to track down any unidentified major offender. Brazelton recommends a list of general allergy control measures in this chapter. I would note, too, that detergents are very often the underlying reason for dry skin in people who don't get eczema, especially adults. I have heard from many people over the years who have resolved lifelong dry skin problems with these strategies. I see eczema as a signal that is triggered as a result of environmental/immunological conditions. A hundred years ago, that signal was rare and helpful (I'll discuss this in more detail in my book). Now the signal is being triggered and amplified under unnatural conditions. In the course of trying to figure out why our son has this reaction to detergents, I have come to believe that the problem has to do with skin membrane permeability. Detergents increase skin membrane permeability in a way that soaps and water do not. This type of eczema — which I believe is probably 25-80% of the eczema problem, depending on the age group — seems purely to result from how detergents increase the permeability of skin. The behavior of the eczema is entirely consistent with that premise. Humans have made soaps for thousands of years, by reacting fats or oils with alkaline substances, such as ashes or soda ash. Synthetic detergents — which can be synthesized from many different kinds of starting ingredients, but were initially developed from petroleum — were invented in the 20th century. Soaps and detergents are long molecules which are attracted to oils on one end and water on the other. Among other differences, detergents are far more hydrophilic (water-attracting) than soaps. Detergent residues also seem to be far more persistent in fabrics and tissues. Humans evolved with the natural fatty acid profile of skin that best repels water while maintaining necessary functions, such as perspiration. Both soaps and detergents remove lipids that help maintain that barrier. In my experience, the effect of detergents on membrane permeability is nonlinear — it goes up exponentially in the presence of small amounts of water (where there is sweating or in the moist environment of the lungs). So someone may touch or be exposed to detergents and seem fine until they sweat, and then the skin will break out, especially in the moist areas. Much of the seeming randomness of eczema affected by detergents comes about because of the unseen exposures from household dust, how they adhere to and are absorbed in the skin, and the nonlinear effect of detergents on skin membrane permeability in the presence of small amounts of water. The effect of detergent residues on the skin membrane is analogous to what happens to these water repellant fabrics. Because of the increased antigen penetration associated with detergents, the way they pervade household dust, and the longer time required to clear those exposures from the lungs, there is almost no way that detergents in the dust of people's homes ISN'T a primary reason for the upswing in asthma rates in recent decades. It was very clear to us that detergents make up a great part of household dust (from residues on hair, lint, skin cells, etc., even flaking from washed surfaces), and that dust is impossible to keep from affecting the skin. Switching to soaps may be helpful for all children with allergies and asthma, even those with no eczema. Detergents are breathed in with household dust, and their presence in lung tissue increases susceptibility of those tissues to allergens that may be causing the asthma. Detergents have been shown to increase membrane healing time, which may also have an impact especially where viruses are associated with asthma. Because the detergent effect on membrane permeability is exponentially greater in the presence of small amounts of water, the unseen effect on the lungs could be significantly greater than the visible effect on the skin. I hear over and over again from people who "outgrow" eczema only to develop asthma. It’s called the “atopic march” — first eczema, then asthma. With detergent-reactive eczema, it’s a logical progression from ongoing detergent exposure. Babies have highly permeable skin and spend a good deal of time with their skin against fabrics or a parent's skin or hair. As children get older, they spend less time lying down or crawling across surfaces. Their skin becomes naturally less permeable, absorbs and retains fewer detergents. They could easily seem to "outgrow" the eczema. But they also become more active and push more air in and out of their lungs. Any damaging effect of detergents on the skin is now unseen in the lungs. Recently, a mother of an asthmatic preschooler thanked me for my web site. Her 5-year-old developed early asthma. She’s a supermom who does everything in her power to minimize the allergy risk in her home, yet still they had inhalers and occasional trips to the hospital. When she removed detergents from their home environment, they finally got the asthma under control. Her son never had eczema. Detergents aren't the underlying cause of the asthma, they merely amplify other processes. Their presence in dust causes a whole set of unseen exposures, complicated by the nonlinear effect in the presence of small amounts of water. A major study of women employed in domestic cleaning in Barcelona, Spain, concluded that “employment in domestic cleaning may induce or aggravate asthma,” and that the risks probably extend to “people undertaking cleaning tasks at home.” [Medina-Ramon M, Zock JP, Kogevinas M, Sunyer J, Anto JM, Asthma symptoms in women employed in domestic cleaning: a community based study. Thorax 2003 Nov;58(11):950-4.] The study authors felt the asthma was probably related to cleaning products but did not make specific conclusions. A plethora of new studies demonstrate that asthma rates in the industrialized world have soared in the last twenty years, even where smoking and air pollution have declined. In that time, breastfeeding, which Brazelton (and research studies) suggests is protective against eczema and asthma, is way up in industrialized countries. And as much as some people suggest that we are too clean today, when I was a child in the ‘60s, I remember women under far greater social pressure to keep clean houses, using a potent armament of cleaning supplies: powerful disinfectants, bleach, ammonia, soaps, unmentionable chemicals we don’t even use today like dry cleaning solvents, and they were WAY more casual about using them. Newsweek dedicated a cover story to the topic of how much LESS we are cleaning today than our parents did. They smoked more, breathed in more polluted air, cleaned house more, and had less asthma. The switch to soaps for asthma will not have the relatively rapid and obvious effect that the switch for eczema will, because it takes weeks for the residues to clear from the lungs. It may take two or three months from the time a home is made detergent-free for the difference to be obvious. No conclusions were made about the protein changes, it was merely an observation made in the course of the research. However, since Dr. Green was an ophthalmologist, he was concerned with the issue of extended healing times and how small amounts of detergents might affect healing from surgery. He did other work investigating other preservatives and detergents from that standpoint. When our son's eczema was at its worst, both I and my husband noticed a marked slowing in our son's ability to heal the usual baby cuts (usually from his fingernails, often from scratching his eczema). Instead of a couple of days to heal completely, a cut might take ten days or two weeks. I thought this was an interesting potential correlation with this eye research. When we got rid of our son's breakouts, his skin started healing normally again. “The new study, led by Peck Ong of the National Jewish Medical and Research Center in Denver, found that the skin of 8 people with the most common form of eczema, known as atopic dermatitis, was sluggish in producing small chemicals called peptides that thwart bacteria, viruses and fungi. The reference for this research: Peck Y. Ong, M.D., Takaaki Ohtake, M.D., Ph.D., Corinne Brandt, B.S., Ian Strickland, Ph.D., Mark Boguniewicz, M.D., Tomas Ganz, M.D., Ph.D., Richard L. Gallo, M.D., Ph.D., and Donald Y.M. Leung, M.D., Ph.D. (2002 Oct 10) Endogenous Antimicrobial Peptides and Skin Infections in Atopic Dermatitis, NEJM 347:1151-1160. People with other types of eczema also often benefit by removing detergents, though they may not completely resolve their eczema. Eliminating detergents in the diets of infants (mainly from dishes) may be preventive by reducing allergens that enter the bloodstream early on. I have been corresponding with a woman who has a similar patient-run site to my own, for a type of eczema called dyshidrosis. I believe from everything I have read that the cause of this type of eczema is probably microbial. The eczema behaves very differently from detergent-reactive eczema. Yet this woman has told me that switching to a detergent-free household last year has essentially ended her breakouts. I think just allowing her skin membrane to function normally allows her immune system to keep the problem under control. Since detergents are ubiquitous in medical environments — on surfaces, fabrics, surgical tools, and even in fractionated blood products — recognizing and understanding this sensitivity may be of some importance to the outcome of other medical care for affected children, perhaps all sick children. If you think your child’s eczema might be caused by detergents, removing ALL SOURCES of detergent may be necessary to tell for certain. I note with some irony that the “before” photo used in my letter to the National Eczema Association for Science and Education (NEASE www.nationaleczema.org) was taken after we had already switched to soaps to wash clothing and linens, soap to wash household surfaces, and soap for handwashed dishes. (Download the letter and photo from the Downloads page. )We hadn’t yet realized we needed to wash our own hair with soap, use a non-detergent product in the dishwasher, or eliminate hidden detergents in processed foods — all relatively minor sources compared with those we had already eliminated. Indeed, at the time, our son’s eczema looked considerably better. But he continued to have breakouts like the one in the photo until we knew how to eliminate all detergent sources. Although this is only my opinion, I believe that anaphylactic allergies — the kind that cause deadly reactions, such as to peanuts — are different than “normal” allergies. It is possible for anyone to be allergic to anything, and it is certainly possible for someone with anaphylactic allergies to also have this detergent sensitivity. However, in my experience so far, I would guess that eczema in a person with anaphylactic allergies is likely from a different cause than detergents, though there may be a secondary benefit in strengthening skin and gut membranes from reducing detergent use as described in the previous paragraphs. However, the risks associated with such a switch need to be considered: many soap products come from the “natural” products sector, and “natural” products may contain food derivatives, such as citrus oils, nut oils, wheat protein, you name it, to which a severely allergic child could react. Parents of children with such severe allergies know how to track down every little ingredient in foods to protect their children; the same vigilance is necessary here. When I first started writing this site, I felt I could only address our direct experience. However, I am frustrated by the poor resources parents are given to problem solve eczema. While switching to soaps is probably a prudent step for anyone with allergies, it will not eliminate everyone’s eczema, other measures are necessary depending on the underlying cause. Some of these measures I hear over and over again from parents who figured them out the hard way. I felt I should share the most common ones. This list is a work in progress based on observations I have made over the years and feedback I have received from my web site. It is my opinion at the present time and not from scientific study. I will likely revise and update it in time, especially to expand solution steps. I note again that I am not a medical professional. Some of these steps, especially #2 below, have their own pitfalls and have to be dealt with in concert with an experienced medical professional. As anyone who has dealt much with eczema knows, there is a wide range of knowledge and opinion in the medical profession about eczema. It is worth finding those doctors with relevant experience. In the case of the eczema causes below, allergists who understand a lot about fungi, and naturopathic physicians with a research background are probably good resources. Detergent-reactive eczema, per this site. In the absence of detergents in the environment, these people have normal skin and no eczema. This eczema has been described precisely in research concerning dermatological patch testing, so I believe it constitutes 25% of adult eczema and what I now believe is probably 40%-60% of infantile eczema. Now that detergents are so ubiquitous, this type of eczema almost exclusively begins in infancy. The increased membrane permeability from detergents probably contributes though is not the cause in other types of eczema as well. Given the mechanism for the eczema, measures that eliminate the eczema should be maintained to reduce susceptibility to asthma, even as the skin becomes naturally less permeable (naturally absorbing less detergent and becoming less reactive to detergent exposures) with age. Microbially-induced eczema, systemic, mainly from an internal yeast/fungal problem but also from indoor environmental mold problems. The eczema seems to result from something brought to the skin in sweat, so it behaves similarly to detergent-reactive eczema. The diaper area may be clear, the skin is most affected when and where there is sweat, washing with non-drying soaps seems to help. These people benefit from a switch to soaps but it doesn't get rid of the problem. Typically they resolve the problem through dietary changes, mainly yeast-suppression diets (not possible with an infant), and antimicrobial measures, mainly antifungal measures that may range from taking probiotics (beneficial bacteria) to antifungal medications prescribed by a physician. Sometimes other support for the immune system is also helpful. I believe this is the segment of eczema that is largely prevented when pregnant women and infants are given probiotics, thus I would put it at about 25-40% of eczema cases, probably closer to 30% of infantile eczema. Associated with this type of eczema (prior to effective interventions) are higher rates of: multiple food allergies and anaphylactic allergies, learning disabilities, autism, asthma, other GI problems, high levels of staph infection, and in adults, Type II diabetes, hayfever, and depression. Frequent washing of the sweat and antibiotic therapies seem to help but result only in short-lived improvements. This type of eczema can appear at any age. There is a great deal of literature by allergists worldwide on the topic of yeasts and the role of antifungal medications in treating eczema. I haven’t found any research I think of as definitive, or offering true solutions, but each paper and experience offers pieces of the puzzle. The following list is a good place to start, though is by no means comprehensive. In that link alone are 157 articles on atopic dermatitis and fungi. Such as, "Framing the future of antifungals in atopic dermatitis." Except for the important measures of taking probiotics (beneficial bacteria, as many strains as possible) and possibly dietary changes that sharply reduce simple sugars and gluten, I strongly recommend against experimenting with antifungal remedies, especially herbs, since the potential pitfalls are far greater than with detergent-reactive eczema. See a medical professional truly experienced in treating fungal problems. I can’t emphasize that enough. An experienced medical professional should be able to explain the potential for Jarisch-Herxheimer responses in fungal treatment, and know how to reduce it. I strongly recommend against taking any general measures involving chronic intake of antifungal treatments (especially herbs), since this can result in serious pitfalls, such as major depression and gallbladder disease. A true solution more likely involves environmental review and a course of treatment intended to completely resolve fungal problems and restore a more normal internal microbial environment (or "microbiome" as it is now popularly called). Proper environmental mold control and a household elimination of detergents should drastically reduce or eliminate asthma symptoms. Food-induced eczema. Foods involved are mainly those with high protein/albumin content or those that contain the highest levels of molds/mycotoxins or promote mold growth: eggs, milk, nuts, wheat, etc. Eczema resolves when the offending food is removed from the diet. According to Dr. Sears, "over 90 percent of food allergies, especially in young children, are caused by seven foods: dairy products, soy, shellfish, wheat, tree nuts, peanuts, egg whites.” Corn, citrus, and tomatoes are also likely suspects — especially corn which is a hidden ingredient in so many processed foods. This type of eczema typically begins in infancy but can begin at any age. Eczema from albumin-containing foods is more often "outgrown" than eczema from other foods. The foods triggering eczema may sometimes be safely reintroduced when a child is older. In contrast to children with detergent-reactive eczema, I think in this case the problem truly is outgrown — the more mature gut becomes naturally less permeable and is no longer letting those proteins into the bloodstream. The health and permeability of the GI tract may be an issue; not eating detergents (mainly from dishes) will probably help but will not eliminate this problem. Eliminating detergents in the diets of infants may be preventive by reducing allergens that enter the bloodstream early on. Probiotics (beneficial bacteria) will likely also help (see section on probiotics and eczema). Research has demonstrated not only reduced rates of infantile eczema with probiotic use, but also a reduced rates of milk allergy. Microbially-induced eczema, mainly fungal (or then complicated by bacterial or viral), superficial. This segment probably includes dyshidrosis and other conditions which behave as if the skin is infected more superficially. The eczema behaves differently than the above types. Removing detergents may reduce frequency of breakouts but will not resolve an existing breakout. Simplistic antimicrobial therapies are often only temporarily helpful and lasting relief involves steps more close to a combination of 1 and 2 above, plus topical antimicrobial therapy and/or scrubbing affected skin with antimicrobial solutions to end an existing breakout. This type of eczema is more a problem for adults and far less so for infants. Immune support or resolution of other health problems may in some cases be enough to prevent recurrence of this type of eczema. All children with eczema are prone to superficial infections, which can require appropriate antimicrobial treatment before eczema will resolve, regardless of the underlying cause. If microbial infections recur quickly after resolving with treatment, sometimes a more thorough approach is necessary. Underlying fungal problems, for example, can create an environment that favors recurrence of pathogenic bacteria, such as with chronic sinusitis. Eczema from low levels of essential fatty acids (EFA’s), which seems to respond in an uncomplicated way to EFA supplementation, eliminating the eczema. Those in category 1 & 2 (detergent-reactive eczema and myco-responsive eczema) will likely have no apparent benefit or may experience a slight increase in eczema from EFA supplementation. Those with eczema that resolves with EFA supplementation will see the least improvement from detergent removal. Uncomplicated contact reactions from irritating substances such as nickel or dyes and perfumes. Some of the classic contact irritants are more likely to be problems in older children and adults than infants. Uncomplicated contact reactions happen right where the skin touches the irritant, so removing the contact irritant resolves the breakouts. Eliminating detergents should decrease susceptibility to reactions. All other reactions, probably less than 10% of the overall eczema population. Includes more idiosyncratic causes like exposure to latex (another ubiquitous substance in modern households). Removal of the offending substance from home environments and possibly immune support typically resolve this kind of eczema. I believe rosacea and psoriasis are probably infectious, and are a different subject altogether — not that people with those conditions can't benefit from these strategies. There are also eczema-like rashes that can appear after acute illness; I’ve heard of a few misdiagnosed initially as eczema. I think they go away relatively quickly without any intervention. Some integrative and natural medicine practitioners approach eczema by taking general steps to strengthen the immune system. Given my own feelings about what allergies are and aren’t, I see it as a different approach that complements rather than conflicts with the above. When carrying too great a load, one can either lessen the load or strengthen the carrier. My approach is more the former, which I think is prudent even if one decides also to do the latter. Eczema and allergies can begin throughout life; I personally feel that the later they appear, the more warranted is attention to the overall health of the immune system in addition to these environmental strategies. Recent research on the use of probiotics (beneficial bacteria) has correlated probiotic use by pregnant woman and infants with a significant reduction in the prevalence of eczema and cow’s milk allergy among at-risk infants — more than 30% reduction in incidence of eczema. Full text of newer articles isn’t usually available in full, but I believe this one can be found on the web: Kalliomaki M, Salminen S, Arvilommi H, Kero P, Koskinen P, Isolauri E, Probiotics in primary prevention of atopic disease: a randomised placebo-controlled trial, Lancet 2001 Apr 7;357(9262):1076-9. Although I could cite other encouraging research on the use of probiotics in some disease prevention — I think they are worth using for a lot of reasons — I have my doubts that probiotic use has much impact on eczema in detergent-allergic children. And it so happens, on our doctor’s recommendation (for other medical reasons), I used probiotics during pregnancy, and we supplemented with probiotics very early, and it had no apparent impact on my son’s eczema. On the other hand, it would be consistent with my own theory about the underlying cause of anaphylactic allergy that children at risk for developing anaphylactic food allergies and the systemic yeast/fungal type of eczema would benefit from (prenatal and possibly early) probiotic supplementation. Research has demonstrated the important role of beneficial bacteria in human disease prevention. Antibiotics, for all the good they have done, wipe out the good bacteria with the bad. They were used for decades without much attention to restoring normal internal flora, in humans and dairy animals. When I was a child, 90% of babies were bottlefed with sterile milk. The chain was broken. It’s truly not surprising that restoring normal bacteria to a child’s milk would aid digestion and decrease the likelihood of dairy allergies and eczema in a certain population. Since these supplements are generally regarded as safe (so long as one is not allergic to anything in a particular formulation, most prominently, dairy or corn), they may be helpful as a part of a preventive approach for allergic kids, and they may be helpful in disease prevention (since children with eczema are more susceptible to certain kinds of infections). There is evidence that they support the immune system. I would personally take them in addition to a problem solving effort, not instead of. But in this case, the potential benefits appear to be great and according to the research, the risks low (unless, again, someone has a severe allergy to any of the ingredients). A probiotic supplement may be worth trying, per your pediatrician’s recommendation. Dr. T. Barry Brazelton (who no longer practices but teaches at Harvard Medical School) felt that he could prevent eczema in virtually all cases by identifying at-risk parents (when one parent had a history of allergy) and giving them simple allergy-reduction steps to follow during pregnancy. He points out that it's a lot easier to prevent problems than eliminate them after the allergy surfaces. This is where I first learned of the difference between soap and detergent, in his description of what to do in his book Touchpoints. In his day, there were fewer sources of detergent in households, but even today the switch during pregnancy would be far simpler than after eczema surfaces. Preventive steps during pregnancy would mainly involve switching washing products. I would love to someday see a simple study done on this. I actually called Brazelton looking for citations, and he said he didn't have any research, he simply realized this from decades of medical practice. Given his experience, plus recent research on probiotics and eczema, I would guess that following his simple allergy-reduction steps, eliminating detergents, and taking probiotics during pregnancy would prevent the vast majority of eczema cases in infants and small children. I don’t want to discourage adults from trying to see if detergents cause their eczema — I have in the past year received numerous letters from parents who cleared up a child’s eczema by removing detergents from the household, only to discover that the measures also cleared up the skin problems of one or more adults in the household — but adults have a wider range of experiences, health problems, and environmental exposures, and their skin problems can be more complex. Particularly for people whose eczema develops later in life rather than in infancy, I am skeptical that detergent sensitivity is the problem, though I stand to be corrected. There might be a rationale for reducing contact with products that increase membrane permeability as detergents do, but switching washing products has its risks as well. If anything, adults considering this switch need to be highly cautious in how they go about it. Deciding that detergents are the main cause of eczema breakouts takes a great deal of work. It may be obvious to you from reading through this that your child has this problem, especially if the eczema is very severe. This section contains some general observations about breakouts, exposures, and the detective-work. The breakouts follow certain rules, they aren’t random. Figure out those rules, and the breakouts make sense. Make a list of probable causes and write it down!! Make a list of everything your child touches, eats, or breathes that you think could be causing the eczema. Try to form some helpful hypotheses as in #2, and write them down. Don’t just make a mental note of everything, don’t try to analyze and weed through the possibilities, just write them down. Once you have a list, arrange the causes with the most likely at the top. Then think of ways to eliminate or “test” each probable cause. Write them down, too! When you try each “test”, consider whether the test is good enough or well-implemented enough to draw conclusions from. If the test isn’t good enough, think of more “tests” before drawing conclusions or throwing out the possible cause. Observe whether the rashes seem to be from something the baby is touching (for example, the eczema might be worse/better under the diaper area or clothing) or if it’s from something the baby is eating (the rash might bloom after every meal or reliably 4 days after a certain food is eaten). Timing is important: what changed in the baby’s life in the month, days, and hours prior to the first breakout? Add any new possible causes to the list! Timing is important! Contact-related rashes typically happen within a few minutes or hours of touching the irritant (remember that traces may then remain on the skin and continue to cause reactions). Ingestion-related rashes can happen quickly but they can also take up to a week to show up after the offending food or substance is eaten (in my experience, most things show up by the 4th day). If the offending food or substance is eaten again, the rash will persist; if not, it may still take another 4 days to a week for the rash to go away. If the rash becomes infected, it will likely not go away until the infection is treated. In my experience, contact-related rashes occur on the skin where the contact occurs; ingestion-related rashes can occur anywhere, but they tend to happen in common spots (such as the upper arms or legs) and new breakouts tend to happen where the skin is already broken out. Because ingestion-related rashes tend to be more persistent — provided one has a safe washing procedure to remove contact irritants so that contact-related rashes go away quickly — ingestion-related rashes are therefore more susceptible to infection. Breakouts are proportional to exposure: big breakouts happen from big exposures to the offending allergen, small or delayed breakouts happen from smaller exposures. Mitigating factors such as a change in humidity could change the absolute measure, but the proportional relationship still holds. Keep a detailed diary of what the baby eats if foods are suspected, and what products are used on the skin and other household surfaces if contact rashes are suspected. Be exact — dehydrated rice cereal is not the same as cooked brown rice is not the same as white rice porridge (white rice cooked for 2 hours in a lot of water). If a washing product is suspected, remember that there are traces left on surfaces no matter how much water was used for rinsing. In that case, rice cooked in soap-washed pots is not the same as rice cooked in detergent-washed pots. Canned pears are not the same as fresh pears are not the same as processed frozen pears. Be aware of ingredients. Allergens — even food allergens like citrus and wheat protein — may be found in soap or detergent dishwashing liquids and dishwasher powder. Minute traces of some allergens can cause severe breakouts. Whatever chemicals you last washed your child’s clothing, skin, hair, bottles, etc., in — traces of those chemicals significant enough to cause a reaction can remain on those surfaces in spite of Herculean rinsing with water. Differentiate between what improves the eczema, and what makes it go away completely. Is dryness, for example, the cause, or a mitigating factor? If you think it is truly the cause, the breakouts will be absolutely proportional to dryness, and this can be quantified. If there proves to be no other variable, and moisturizing isn’t enough to completely make the outbreaks go away, a naturopath, holistic allergist, or nutritionist may be able to recommend dietary changes to help hydrate the skin. If the breakouts continue, or don’t track dryness absolutely, dryness may be a mitigating factor rather than a cause, and it may be worthwhile to continue searching. It has been my observation that bottle fed babies are more likely to develop early, severe eczema, and eczema in breastfed babies often surfaces when breastfeeding tapers off (although it certainly can start during breastfeeding, especially if the cause is a food). If eczema begins as breastfeeding tapers off, it may be that the irritant has been present in the baby’s environment all along — breastfeeding tends to have a protective effect with “normal” allergy — in this case, the clues from timing are a little different. Some clues can be misleading. For example, this detergent allergy can easily make it seem that foods are the cause of eczema, some foods more than others because of how they are processed, prepared, or served. Detergent sensitivity can behave exactly like multiple food allergies or dust-mite allergies. Skin allergy testing results could inadvertently reinforce a wrong conclusion. Removing the allergen from one’s environment is not linearly related to clearing the eczema, at least it wasn’t for detergent exposure. You don’t get 50% improvement by removing 50% of the allergen — exposures don’t quite work that way. If you remove 99% of the sources, but your child spends a few hours in contact with the one sheet or article of clothing you didn’t wash in soap, you have a bad breakout to deal with. You pretty much have to get as close to 100% detergent-free as possible. But then if you have the right answer, the eczema will clear up as if a miracle has occurred. Once you have cleared up the eczema entirely, it is possible to see how new breakouts make absolute sense relative to exposures. We gathered our list of possible causes from suggestions given by our pediatrician, naturopath, allergist, and from the most common allergens mentioned in parenting books (including Touchpoints). We consulted a pediatric nutritionist along the way, too. The medical professionals we consulted may not have had the answer for us, but they imparted plenty of wisdom: they told us which kinds of allergens, from their experience, caused very bad cases of eczema; they gave us information, resources, ideas, and interpretations that proved invaluable. They offered practical advice: our son’s pediatrician, for example, clued us into the difference between barrier-type and emollient-type moisturizers, so that we were able to use the barrier-type moisturizers to help track down contact-related breakouts. Although our pediatrician suggested moisturizing and using cortisone (not a solution in our case), and the naturopath and allergist suggested such a severe allergy had to be from milk protein (which made no sense to us given the timing), everyone gave us a clear idea of what to expect with each suggestion, and that helped us define the problem. Our pediatrician was pragmatic about treating infections empirically, and this too proved invaluable. Had we needed it, the pediatric nutritionist could have outlined a safe allergy elimination diet for us. I can remember one watershed moment, after we had already switched to soap products for washing laundry and household surfaces. Our son was starting to eat solid foods, and he seemed to be allergic to everything. I called and spoke with our pediatrician’s assistant. “He’s allergic to pears!” I wailed, “WHO is allergic to PEARS!” “You don’t know that he’s allergic to pears,” she said, “all you know is that he’s allergic to CANNED pears.” She was absolutely right. It was as if a light went on in my head. I resolved to be as analytical about the situation as I needed to be to solve the problem completely. We were blessed with professionals who were willing to give us the benefit of their knowledge and experience, trust our judgment, and talk over our concerns and anything we disagreed with. It made all the difference. Even though they did not have all the answers — no one had the answer we needed — we benefited from their wisdom and help immensely. We could not have put the whole puzzle together without their help. It is important to have a good relationship with experienced medical professionals when trying to solve a problem like this. They can help immensely even if they do not have all the answers. It is really essential to implement something this complicated in concert with a good medical professional. They can help sort through your individual situation from a trained perspective, ensure that everything is done safely, and respond to any problems that arise. You may wish to eliminate serious food allergens first before trying to eliminate detergents, or you won’t know how much of an impact the detergent elimination has relative to food elimination. According to Dr. Sears, "over 90 percent of food allergies, especially in young children, are caused by seven foods: dairy products, soy, shellfish, wheat, tree nuts, peanuts, egg whites.” Corn, citrus, and tomatoes are also likely suspects — especially corn which is a hidden ingredient in so many processed foods. Allergy testing can be a helpful way of discerning food, pollen, mold, animal, and other allergies. On that note, I feel I should weigh in on the blood vs. skin allergy testing issue. Please remember that this is just my layman’s opinion, I am not a medical professional. Both the allergist and naturopathic doctors told me that allergy testing in infants before the immune system is mature is dicey and can be misleading. In my own experience, doctors who do skin allergy testing can be very convincing that skin testing is more reliable, and doctors who do blood testing are equally convincing that blood testing is just as good or better than skin testing. I have walked out of allergists offices completely convinced of one side or the other, depending on the preference of the allergist. The big difference, in my opinion, is that skin allergy testing hurts. A lot. It just seems cruel to do such tests on infants and very young children, yet I have known any number of parents who have been talked into subjecting their babies to them. I’m sure there must be exceptions out there, but of the people I know, not a one feels the skin tests were worth it. The performance of the tests depend on so many more human factors than the blood tests, the skin tests have more avenues for introducing errors and flaws. In the case of this detergent allergy, skin tests could be highly unreliable. One possible result is that the child reacts to virtually everything by skin test, but very few things by blood test. Detergent-reactive eczema is caused by how detergents affect skin membrane permeability and is not a true IgE-mediated allergy. In fact, very few people (if any) have a true allergy to detergents, most detergent allergies are actually allergies to product enzymes and additives. You could not test for detergent reactivity with traditional allergy blood tests. One of the enduring puzzles in dermatology seems to be why skin patch testing and blood allergy testing often yield very different results. From what I gather by reading papers on the subject, I would guess that the tests would yield much more similar results if study subjects came from detergent-free households. What these researchers call a “higher skin susceptibility” appears to be in the population which is most affected by detergents’ effects on skin membrane permeability. The researchers’ detailed description of the eczema in these patients is identical to detergent-reactive eczema. "...the degree of skin reaction depends on the concentration [of SLS]"
"... patients with an increased skin susceptibility (defined as a visible skin reaction to SLS) developed a higher rate of nonspecific erythematous reactions to several allergens." "An increased skin reaction to SLS will decrease again ... after acute eczema has healed..."
In plain English, if you react to an SLS patch test — SLS being the most common household detergent — you are also more likely to react to many things by skin test that you aren't truly allergic to. One of the features of this detergent-reactive eczema is that one may be positive to many things by skin test but few things by blood test. The apparent positive would come from detergent traces on the skin and the nonlinear increase in local skin membrane permeability from the increase in moisture at the test site (such as from the enclosed patch or fluid from a skin prick test in that case). The research describes how, when the acute eczema of study subjects healed — in detergent-reactive eczema, that means detergent exposures are reduced — the SLS reaction decreases again. In detergent-reactive eczema, the reactivity of the skin to a given detergent exposure decreases when the skin is allowed to heal and become normal away from persistent detergent exposures, and increases again in the presence of persistent exposures. My conclusion from this very thorough research study is that an SLS patch test may be useful to identify someone with this detergent-reactive eczema. A clinical trial would have to be done to establish how specific an SLS reaction is to detergent-reactive eczema, in other words, how well a reaction to an SLS patch test identifies someone with this detergent-reactive eczema — but I think the results of this study imply that the correlation would be good. Since sodium lauryl sulfate and similar surfactants are so ubiquitous in home environments today, it may be useful even now to talk to a doctor about an SLS patch test. If it is positive, these detergents removal steps will almost certainly help. Based on my reading of the above research, an 0.5% SLS patch test for 48 hours would be better than the 0.25% test. Since no research has been done on the specificity of this test for detergent-reactive eczema — and I have no idea of the safety considerations for infants, it’s important to ask the dermatologist or allergist — the results should be an informative guide but not regarded as definitive. No one yet knows the parameters for proper performance of such a test for this purpose. He gets eczema all over, but you use disposable diapers and the diaper area is relatively clear of eczema. Her eczema changes noticeably, either for better or worse, following a bath or shower. His eczema sometimes seems to fluctuate wildly from day to day. Washing just with water can sometimes cause an outbreak. She gets particularly bad eczema on her cheeks or chin where she rests it on your shoulder or against your hair when you hold her. His pattern of eczema from foods is inconsistent or follows strange lines: he might seem allergic to cooked or canned foods but not to fresh ones, or he reacts more to cooked foods than to raw ones (if it’s a protein allergy, it should logically be the other way around). Her eczema is worse on exposed skin, especially as she crawls around during the day. Sweating makes the eczema markedly worse. Or the eczema is worse in areas that remain moist, such as behind the knees. He reacts to just about everything on the allergy skin tests, yet his blood tests show very few allergies. Her eczema does seem related to what you are using to wash her or the laundry with, but switching products has maybe improved it but never made it go away. He seems to get eczema from just about everything he touches and eats. His eczema improved after infancy, but you just can’t seem to make it go away. After the eczema started getting better, the asthma symptoms started up. Important note (July 2007): I used to recommend unscented Dove for this test. As of January 2007, the makers of unscented Dove have discontinued the product and changed the surfactant formula in unscented Dove Sensitive Skin. Until further notice, I cannot recommend unscented Dove Sensitive Skin at all. Most especially, do not use it for the washing test. I am searching for an equivalent replacement. Until I can find one, use Sappo Hill Soapworks unscented bar soap. As always, test on a small area first for individual sensitivities. For more information about the changes to unscented Dove, see my blog www.solveeczema.wordpress.com . I have suggested the following to some people as a simple “test” to judge whether more “tests” or work are warranted. It is not foolproof. People can be allergic to anything; if one has a specific allergic to any of these products, the results will be misleading. If the eczema is infected it won’t clear up even if this is the answer. This test will only affect contact-related eczema (eczema from touching the irritating substance), it will not affect ingestion-related eczema (eczema from eating the irritating substance). The principle here is to remove all detergent residues from the skin and coat it with a thick layer of a barrier moisturizer long enough for the skin to start healing. This “test” will allow the skin a few hours’ relief, enough to see a difference in contact-related eczema. If one has this detergent allergy, emollient moisturizers will make things worse and should be avoided for this test. Detergents are so ubiquitous in our environments, and so persistent in human tissue, water alone will not be sufficient to remove them. The washing product I recommend for removing the detergent residues for this test is Cal Ben's liquid dishglow from a foaming dispenser. Do not use it straight as it is quite concentrated. Rinse especially well. Remember that some residues of anything you use will be sealed in by the barrier moisturizer — if you have any concerns, consult your doctor and if necessary, start with a small area as a test for individual allergy to the soap ingredients or the Aquaphor. SUBSTITUTING A DETERGENT PRODUCT FOR THIS TEST IS NOT OKAY, EVEN IF THE DETERGENT IS COMBINED WITH OILS. DO NOT SUBSTITUTE WITH A DETERGENT PRODUCT LIKE CETAPHIL, EVEN IF IT IS CONSIDERED “HYPOALLERGENIC”. Cetaphil may be a great product for someone like me who is not allergic to detergent. But it is a problem for someone with this detergent allergy. One mother I was trying to help used Cetaphil without telling me, and her child’s skin blistered. Use only a good cleansing true soap for the purposes of this test. Barrier moisturizers include Aquaphor and Vaseline Petroleum Jelly. One person responded to my letter in the NEASE Advocate by making a general recommendation for a product he manufactures called Hydrolatum, which appears to be a benign barrier moisturizer as well, though I have no experience with it myself. Eucerin (made by the Eucerin company, which also makes Aquaphor) is NOT the same as Aquaphor and is NOT a barrier moisturizer for the purposes of this test. Please be aware that words for moisturizer categories are non-standard and even contradictory. Some researchers in the UK have published papers touting "emollient" moisturizers as best for eczema sufferers; the specific types of products they mean are the same as I describe as "barrier" moisturizers. Please read through the entire washing procedure before starting; safety in the bathroom comes first. If it’s not possible to follow these instructions safely, another option is to wash a cup for rinsing, or the bathroom surfaces, or anything else as necessary, with soap, and rinse well. Cal Ben's liquid dish soap (straight) works well for removing detergents from hard surfaces. Rinse well, it is quite concentrated. The best time to do this test is in the evening just before your child goes to bed, because s/he will be less active. First wash your hands well with the Cal Ben's dish soap foam. Rinse them well under the tap. Dry them only with new paper towels such as Bounty, not with fabric towels. Try to take the paper towels right off the roll, don’t set them on a flat, washed surface. If your child gets eczema on his/her lower arms or legs, wash one arm or leg well with the Cal Ben foam (using your hands or paper towel, not a washcloth). Rinse the arm or leg well under the tap only, not in a bath or sink. Do not use a container to pour the water. Use the water directly out of the tap and use your hands if necessary to direct it. Do not let the skin touch the sides of the sink or tub. If that happens, wash and rinse the skin again. Dry only with paper towels. Do not allow the washed skin to contact anything (especially not your clothing) before slathering it with a thick layer of a barrier moisturizer like Aquaphor. If you have a used tub of this moisturizer, be sure to scrape off a layer of it with your soap-washed hands before using it so that no residues of detergents from past use have made it into the mix. If the procedure is helping, the eczema should look improved within as little as a half hour. If your child’s eczema in the test area looks markedly different after a few hours, then there is a good possibility that a contact reaction to detergents is involved; it’s a virtual certainty that a contact reaction of some sort is involved. If your child’s eczema doesn’t look different at all, it could be because the eczema is ingestion-related rather than contact-related, or because it is infected and will have to be treated before it will go away. The most commonly asked question of people who responded to my letter in the NEASE Advocate was: where do I find soap products?! I put a list at the end of this discussion. I tried to include as many different kinds of soap and non-detergent products as I could; I have not used all of them, and I am not endorsing any of them. It’s always possible that I have overlooked a detergent ingredient in a product I have not used; I tried to be careful, but these days even very thorough research isn’t always enough. Please read the entire discussion before making any changes. Be aware that sometimes companies will switch ingredients without warning. It pays to be aware of the developments in surfactant chemistry and labeling to know what you are using. Soaps and detergents are both surfactants. They are similar, but not the same. Humans have made soaps for thousands of years, by reacting fats or oils with alkaline substances, such as ashes or soda ash. Detergents can be synthesized from many different kinds of starting ingredients, but were mainly developed from petroleum. In developing something similar to soaps, the aim was also to overcome the shortcomings of soaps — to make something that would work over a broader range of water mineral conditions and temperature extremes. Soaps and detergents thus historically differed both in their starting ingredients and in the chemical properties of the end result. Initially, the general public distinguished soaps and detergents only by their starting ingredients: surfactants made from plant and animal fats were called soaps, surfactants made from petroleum were called detergents. Especially during the times of fat and oil shortages, it was a valid distinction. To this day, many people still distinguish soaps from detergents this way. By the SDA definition, however, detergents can be made from other ingredients. In today’s climate, petroleum derivatives have lost favor with consumers of “natural” products. Manufacturers have filled the niche with a plethora of products synthesized from non-petroleum starting ingredients — considered more “natural” by some — and which work better in hard water than soap. For the purpose of switching from detergents to soaps to eliminate this eczema, most of these plant-based surfactants would be considered detergents, not soaps. Unfortunately, the confusion in definitions makes an already difficult hunt for true soaps even harder. I think this is one reason more people haven’t figured this difference out today as Dr. Brazelton did in his practice. If you are trying to make this switch from detergents to soaps, use only traditional soaps. Products that contain soap will say “soap” as the first ingredient on the INGREDIENTS label. All-soap-based products will not have further “nonionic vegetable-based surfactants” or other non-soap surfactants listed in the ingredients. It is possible that a manufacturer could list a soap ingredient as a “vegetable-based surfactant.” If the manufacturer otherwise advertises that the product is a soap product (as opposed to a detergent), follow up with questions. Ask point blank: is this product a traditional anionic soap? In my experience, sometimes it is, most of the time it is not. In one case, the maker applied the historic distinction between soaps and detergents, and claimed in an email that their product was a soap product, even when it was clear from the label that it was a combination of a soap and a nonionic vegetable-based surfactant, clearly not all traditional soap. The word “soap” means absolutely nothing on the FRONT label of the product and is commonly used for detergent products. Even organic or “natural” products that say “soap” on the FRONT label are often all detergent and contain no soap. Some products on the market are a combination of traditional soap and “nonionic vegetable-based surfactants.” I do not know if these products are okay for children with this allergy. I suspect that some of them may be, particularly if the nonionic surfactant is a minor ingredient relative to the soap, but I would not recommend trying them initially because the effect is unknown. If you clear up the eczema by making the entire switch, you can always experiment with new products later. But this switch is so much work and fraught with so many pitfalls as it is, I would not personally recommend adding an unknown like a combination product to start. Many cleaning products on the natural-store shelves are made from 100% nonionic vegetable-based surfactants. I do not know if these products are okay for children with this allergy. I strongly suspect that they are not. I would consider them detergents for the purposes of this allergy. Parenthetically, a spokesperson from Nikwak pointed out that their company deliberately does not use nonionic vegetable-based surfactants in the soap washes they make for waterproof high-tech outdoor fabrics. Water conditioners like Borax or Oxo-brite are not detergents and are okay so long as one does not have an individual allergy to them. I use them in addition to soap, not instead of. Many soap-based washing products contain other ingredients to boost the efficacy of soap, which is okay, again, so long as one does not have an individual allergy to the ingredients. Even if you do everything by the book, and your child’s eczema proves to be caused only by detergents, you will probably still have detective work to clear the eczema 100%. Be diligent and don’t guess. If you want to make this switch and have any concerns that something MIGHT not be traditional soap, don’t use it. Stick with what you know. Soaps do a marvelous job of cleaning in soft water; in my personal opinion, the result with soaps is better than from detergents in soft water. But since the introduction of detergents, which work over a broader range of water conditions, home water softeners have become rare. Absent soft water, consumers complain that soaps don’t work as well, and stopped using them. At the end of the 20th century, true soap flake makers began to pull their products from supermarket shelves. Ivory Snow, once the premier soap flake for baby clothing, became a detergent about ten years ago. White King stopped selling soap flakes in stores around 1998. I do not know of any traditional grocery or natural foods chain that sells true soap flakes anymore in the United States, though they can be found in markets in countries like France and England. I have a provided a list of online sources in the List of Products. Some soap products can be harsh and drying; many fine soap products are not. Finding them is the trick. Many baby books recommend “superfatted soaps” for babies. Be aware of advertising hype as you try to locate products. Consumers Union sponsors a site to explain labeling terms http://www.greenerchoices.org/eco-labels/eco-home.cfm?redirect=1. The term “natural” is no more helpful. “There is no government or official definition for this term except on meat and poultry products." Switching to soaps is a lot of work. Clearing up eczema by removing the detergent exposures in the environment is not a linear process. You don’t get 50% improvement by removing 50% of the sources, exposures don’t work that way. If you remove 99% of the sources, but your child spends a few hours in contact with the one sheet or article of clothing you didn’t wash in soap, you have a bad breakout to deal with. You have to get as close to 100% removal of all sources of contact as possible to eliminate the eczema. If you are willing to do the work, and this is the problem, the results are nothing short of miraculous. If you aren’t willing to do the work, it’s probably not worth the effort to do it half way, because you probably won’t even see half improvement. On the other hand, the reactions are proportional. Two hours spent in contact with a fabric washed in a strong detergent will cause worse eczema than two hours spent in contact with a fabric washed in a mild detergent. This is why, for example, someone with this allergy might see an improvement using a mild detergent like Dreft, yet fail to eliminate the eczema. To get 100% removal of all sources, at least at the start, everyone in the household should make the switch if feasible. Your child spends time in contact with you and your clothing — if you don’t make the switch she will be exposed to detergents every time she touches you. Your clothing, skin, and hair will continue to leave detergents in the household dust from lint, skin cells, etc. Combining soap and detergent laundry products in the wash is problematic, and detergent residues in the dryer will have to be constantly washed out rather than once at the start. It’s better if everyone switches, provided everyone tolerates the switch. You can always experiment with changes once the eczema is cleared up. One of the things that I remember from working in chemistry labs (before studying engineering) is how incredibly difficult it is to remove all residues of anything from any surface. Detergents can be very persistent. Think of nothing as clean; _top_ think of everything as coated in a layer of whatever it was last washed in at the very least. For the purposes of someone who is very allergic, you can’t really wash anything completely away with water. You can only find things that don’t cause the rashes to wash away the things that do. There are grades of detergent strengths. The stronger detergents seem to be a greater problem for children with this allergy. All are a problem for children with this allergy if you want to make the eczema go away rather than just improve it. Many detergent products are mislabeled as “soap”, but you can tell the difference by reading ingredients. One chemist told me that many detergents have a chemical name that resembles sodium lauryl sulfate, i.e., “sodium [something something something] –ate”. The chemical names will start with sodium or potassium. This is not true of all detergents by any means. When in doubt, check with the manufacturer — ask if any of the ingredients are classified as detergents. The online dictionary www.thefreedictionary.com is another good resource for checking the classification of some chemicals. The National Institutes of Health and the National Library of Medicine sponsor a site http://householdproducts.nlm.nih.gov/index.htm. You can type in the names of household products or the chemical names and get a flood of information about them, such as the entire ingredients list. If you find a chemical using the search function, click on the link to chemical information. Once there, click on the “Full Record” link on the left side of the page. You won’t find “this is a soap” or “this is a detergent” stated explicity, but the information is usually in there somewhere. The Environmental Working Group http://www.ewg.org has a cosmetics database with thousands of personal care and household products. For every product, there is a list of ingredients and specifics about each ingredient. These entries should say whether an ingredient is a detergent/surfactant. Traditional soaps are anionic. “Nonionic vegetable-based surfactants” are not traditional soap, even if they have been made with plant-based fats. However, some of the plant-based soap/nonionic surfactant combination products may prove to be okay for this allergy, I don’t know. I would not start with these or any of the 100% nonionic products. Once you clear up the eczema, you can switch products one at a time to see if they are okay. Many detergents that cause this eczema, like sodium lauryl sulfate, are anionic like soap— the molecular charge is not the deciding variable here — but knowing soaps are anoinic can help you avoid compounds that are not traditional soap. simple chemical names for soap, e.g. sodium cocoate (soap from olive oil, or castile soap), sodium tallowate (soap from tallow), sodium palmate, etc. Soaps can also be made with potassium hydroxide, in which case, for example, soap from olive oil would be "potassium olivate". Traces of detergents significant enough to cause severe eczema persist in clothing in spite of Herculean rinsing. An extra rinse or two is nothing with this allergy. Traces of detergents stay on dish surfaces despite repeated rinsing with water. Fragrances are not the issue either, though they are common irritants; the problem here is the detergent. Fragrance-free detergent is not the solution here. This solution is a great deal of work at the outset, but it does get better. On balance, I felt it was easier to take steps to prevent the eczema than to cope with the problems caused by it. Once we eliminated the eczema, our son’s skin became stronger and less fragile. Once it healed and wasn’t broken out all the time, it was less susceptible to breakouts from dry contact with detergent-washed surfaces. Wet contact with detergent-washed surfaces — contact in the presence of water — is a more serious problem than dry contact. Infected patches have to be treated before they will go away. Bacterial problems may be obvious, but for the most part, fungal problems are hard to diagnose and have to be treated empirically. Having a good pediatrician or dermatologist who is experienced and willing to work with you is key. Be alert for antimicrobial products containing ingredients that cause breakouts. Try to find ones that don’t cause breakouts (of the ones we’ve used, only a few did, most did not). When the antimicrobials caused breakouts themselves, in our experience, neither the infection nor the eczema cleared. In my experience, tallow soaps give the best results and are the least drying. Vegetarians should take care as tallow can come from animal fats. In fact, I thought all tallow came from animal fats, but the soap we use from Cal-Ben Soap Company lists ingredients as “vegetable-based tallow” or from “vegetable tallow oil.” If the source of the oils is important to you, please double check with the manufacturer. I’m sorry to say this, but if you don’t have access to your own washing machine and dryer, I don’t know how to advise this switch. If you have very hard water, soaps may not work well enough to remove detergent residues, and they won’t work well for cleaning. Soaps form scum in hard water. If you have hard water, the transition to soft water is an adjustment. All surfactants foam better in soft water, so you use far less to wash hair, dishes, laundry. At first it seems harder to get things clean, until you realize it’s only because of superior sudsing. When you realize that all of those residues remained in your hair and clothing with hard water, and that the feeling you associated with “clean” was really the friction from unwashed residues, then you appreciate how much cleaner you are with soft water! It is possible to get by without a softener if you have medium water, but if you have hard water, it may be necessary to get a mechanical softener to make this switch to soaps. Hard water can be a serious stumbling block to implementing the site strategies well. Everything in your home that has been washed is covered with detergent, unless you went out of your way to use soaps. Assume new clothing, fabrics, and stuffed animals have detergent residues in them. The household dust contains detergent residues. If you don’t already have a good HEPA or electrostatically filtered vacuum, get one, preferably with a hose attachment for dusting surfaces. Be sure to get a high quality one — I know about at least one cheaper product that leaked the air around the electrical cord without filtering it. Miele makes very good vacuums, but there are many others. Having a household air filter is not the same thing, the vacuum is essential for removing detergent dusts from carpets and other surfaces. In this case, dusting by vacuuming is the way to go, not wiping with a wet rag!! You may have to change the filters more often than recommended by the manufacturers, especially if you use electrostatic filters. Keep up the vacuuming throughout the detergent removal process. Once you’ve made the switch completely, your dust won’t contain detergents anymore and you can reduce the vacuuming to whatever level you need for general allergy control. It may be impossible to remove enough residues from fabric floor coverings, but in my experience, low levels of detergents can come off of nylon carpeting over time just from vacuuming. Children who get severe eczema like this generally have other allergic susceptibilities. A vacuum with an adequate filter is an important allergy control measure. Fabrics that have been washed in detergent have stubborn traces of detergents in them, often high levels of detergents if they have been washed many times. Most people with eczema use the extra rinse cycle, but it’s really nothing when it comes to this allergy. It’s necessary to do extra washing at the start to remove detergents residues in fabrics. This is such a difficult but important step, it’s a good idea to sequester the things that have already been superwashed in soap. New clothing and towels have detergent residues in them usually, but it’s far less than the clothing most people already have. Once you have removed the detergent residues entirely, you will be able to wash everything normally with soap. Again, it’s not a good idea to just wash the baby’s things in soap and everyone else’s in detergent. Don’t mix the two, make the switch entirely until you see the results. I wish I could give exact advice for superwashing the clothing, but I don’t have all the answers. When I get hand-me-down clothes from other people, sometimes I have to wash them ten or more times in soap before I get enough detergent residues out that my son stops reacting to them. (Water alone in this case would be hopeless.) Don’t despair, though, I don’t think it’s necessary to do that much washing in all cases. It’s even more difficult to remove residues from some synthetics than cottons, so my suggestion would be to start only with 100% cotton clothing and fabrics. This summer, for example, my son wore some hand-me-down cotton shirts that had been washed many times and didn’t seem to give him any trouble. But when it got hot and he sweated, he got a ring of eczema around the collar area — it turns out, the synthetic combinations in the collars don’t have to be labeled, and they hang onto the detergent residues better. I knew this was contact eczema because it “washed off” using the washing procedure outlined previously. When I washed the shirts several times more with soap, they no longer caused the eczema where the collars touched my son’s skin, even when the weather was very hot. Products like Borax, Oxo-brite, or old-fashioned washing soda (Arm and Hammer sells one) can help boost the efficacy of the soap flakes. Vinegar might help remove residues, but use it alone, don’t use it with the soap; vinegar lowers the pH, soap works better at higher pH. Vinegar in the laundry can make blue dyes run, don’t use it with blue and purple fabrics. I’ve never used vinegar with soft water, I suspect it’s not necessary. What I suggest to people at a minimum to start is this: wash the laundry once or twice with soap flakes and a booster like Borax or Oxo-brite, then do one more full wash cycle with just soap, then do at least two more wash cycles with just water (nothing added). Use the prewash and extra rinse cycles each time if available. Remember to wash any laundry room surfaces on which you set the clothing with soap (preferably a good dish soap — but be careful, these are the most frequently mislabeled when they are actually detergent). Also, wash your laundry basket the first time as well. Don’t take anything for granted, every detergent exposure could affect the outcome. Do not use fabric softeners. If your laundry comes out so hard that you think you can’t live without them, your water is probably too hard for effective cleaning with soap. Once the laundry has been superwashed, and the eczema eliminated, it may be possible to reintroduce a liquid fabric softener, using extreme caution with the ingredients. I wouldn’t recommend adding back a softener, but some people feel it’s necessary. Do not use a fabric softener during the superwashing process, it makes the detergent residues harder to remove and may be an independent source of allergy problems as well. I know very little about this topic, but since it is a safety issue, I will simply pass along what I have read or been told. Some clothing, especially polyester children’s clothing, specifies on the label that it should be washed in detergent, i.e., not soap, because the flame retardant properties are affected. Polyester is now the standard for flame retardant children’s clothing. When Ivory Snow switched from being a soap product to a detergent product, a company spokesperson admitted to me that this was one reason, probably over potential liability concerns. As for the effects of soap on fabric flammability, the major effect comes from the calcium and other metal ions left on the fabric. The effect is, of course, more pronounced when using hard water. The calcium interacts with the fatty acids that make up the soap. This interaction can form insoluble soap residues that may remain on the fabric. If there is sufficient buildup of this residue, the fabrics may become easier to ignite and may burn more easily. This can happen with virtually all types of fabrics - natural and synthetic. Most detergents are made up of materials that do not form insoluble calcium salts, so there is less of an effect. Calcium salts can still build up and affect fabric flammability, but the residues do not contain the fatty acids and usually produce a smaller effect on the fabric's burning characteristics. While these effects can be clearly demonstrated in laboratory tests, such as the test required for children's sleepwear, they are not something that most consumers would ever notice. Fabrics washed in soap or detergent can be safely worn as long as reasonable safety precautions are observed. All fabrics will burn under the proper circumstances and should always be protected from potential ignition sources. It may be another reason to get a mechanical water softener (which removes calcium) if one plans to use soap for the long term. I do not know the implications of using soap and soft water and whether that solves this problem or not. 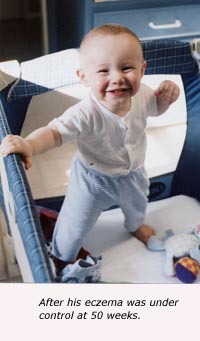 The government standards for flame-retardant children’s clothing also include snug-fitting cotton clothing. Step 3: Wash all household surfaces with soap and rinse using running water when possible, and soap-washed rags or towels if not — chairs, tables, counters, sinks, floors, high chairs, etc. Don't forget the baby equipment like strollers, playpens, etc. From this point on, use soap rather than detergent products to wash household surfaces. Disinfectants like pure bleach are not detergents, though they can be irritating unless properly removed. Vinegar is an effective household cleaning agent, as is borax. If you decide to use disinfectants like Lysol cleaner that contain detergents — I do sometimes — just be sure to wash the same surfaces well with soap to remove the detergents after disinfection. (Do not mix any of these products together.) Soap should be sufficient for most household cleaning. If your child takes a bath in a tub used by the rest of the family, you will have to scrub it well with soap to remove all detergent residues. Virtually all shampoos these days are detergent products. Even tiny traces remaining on surfaces can cause severe eczema. Exposure to detergents in the presence of water is a much more serious problem than dry exposure. It is essential to be fastidious about removing detergent residues from bathroom surfaces and completely switching to soaps, or be religious about washing off the detergents before every use by your child. For surfaces you cannot wash with soap, such as a sofa or stroller seat that cannot be washed, it may help to put a layer between your child and the surfaces, such as laying down a soap-washed sheet or baby blanket. Just a warning — one layer may not be enough. My son got some eczema through three layers of fabric — fabrics are not impermeable — we had to wash the stroller seat in soap to keep him from reacting. Step 4: Wash all the dishes, pots, pans, utensils, and all other food preparation gear with true dish soap or in the dishwasher with non-detergent dishwashing powder. It is not necessary to superwash hard surfaces like dishes, but rinsing with water alone is not enough. Use a dish soap to remove dish detergent residues. Before you start, be sure to throw away the old sponge that contains detergent residues, and use only soap-washed kitchen towels or paper towels from now on. I think new sponges may contain detergent surfactants, try to “wash” them out with soap. The dried sponges from Trader Joe’s are probably a good bet — this is just a guess, but my suspicion would be that the detergents in new sponges are there to keep them soft (detergents are highly hydrophilic and don’t dry out easily), therefore the dried, super-compacted sponges probably don’t have a lot of detergent in them if they have any at all. This is probably the easiest step, it just requires throwing away the old sponge and switching to a true dish soap and non-detergent dishwashing powder, and making sure everything used from that point on has been washed in soap. Step 5: Change all personal care products to non-detergent, including toothpaste. You will still come into contact with detergents outside the home. As your child’s skin heals, it will withstand these contacts better, but you will still need to remove them on a regular basis. There are different theories about bathing when it comes to eczema. Some doctors think bathing and moisturizing every day is important for hydration. Some doctors think it causes dry skin and suggest bathing as infrequently as possible. We came to the conclusion, for our son at least, that bathing every day was too drying. While it removed the detergent residues, it also made his skin more susceptible to outbreaks from lower levels of detergents. We also came to the conclusion that washing only once a week wasn’t enough, because the detergent exposures needed more frequent removal to keep the skin healed. Bathing twice a week, or every other day in summer, is probably a good balance, at least it was for us. We didn’t plan the baths on a schedule, rather we tended to bathe after major exposures every few days. Scheduling baths after play or visits outside the home that bring your child into contact with detergent-washed surfaces is a good contact-eczema control measure. If your child attends preschool and comes home every day with a contact rash, bathing every day is probably unavoidable, just be sure to wash with a true, cleansing soap (like Cal Ben's liquid dish soap from a foaming dispenser), rinse well, dry with your soap-washed towels, and coat the clean skin with Aquaphor or another barrier moisturizer immediately after. As the skin becomes stronger and the home more and more free of detergents, the Aquaphor may become unnecessary, especially in the summer. Before applying barrier moisturizers, use the washing procedure to clean skin of any detergent residues that may have accumulated during the day. If you cover the skin with a barrier moisturizer, you seal in whatever is underneath, and a reaction will follow if your child’s dry skin has any detergent dusts on the surface. The dry skin may not react, but once you put the barrier moisturizer over it, the skin becomes more moist and permeable under the barrier, and thus more susceptible to any trapped detergent residues. Bathing only removes contact eczema, it will not remove ingestion-related eczema. Bathing will not remove infected eczema, which usually needs treatment before it will go away. Washing dishes and kitchenware in soap removes the greatest source of detergents in most people’s diets. Normal cooking and eating from detergent-washed dishes can introduce significant traces of detergents, from some foods more than others depending on the preparation or serving method. It may mistakenly seem as if those foods are causing the eczema. Once the dishes and kitchenware have been washed in soaps, detergents in foods are a lesser part of the problem but the toughest to ferret out. To get rid of the eczema completely, it is necessary to eliminate detergents in foods entirely. If you get a huge reduction in eczema from transitioning to soaps, but there remain hard-to-pinpoint breakouts that tend to be in the same areas, they are probably from detergents in foods. A woman in New Jersey, whose 3-year-old son had been the worst case of eczema in her pediatrician’s practice, said she and the pediatrician used to cry together over it. Early in our conversation, she gave me a long list of foods she thought her son was allergic to. After she was able to clear up the majority of his eczema by switching to soaps, she said that he was only allergic to nuts and eggs after all. This is a tough step to talk about because people can quickly become overwhelmed thinking about it. But there are a few places to look for the biggest sources. Many processed and prepared foods have detergents in them, as we have found. At least, when our son has gotten eczema from certain foods and we’ve been able to get the same food completely unprocessed or with absolute certainty that no detergents were introduced, he didn’t react to them. He got eczema, for example, from canned, jarred, pureed, and frozen peas, but he did not get eczema from fresh peas that we shelled and prepared in our own soap-washed kitchen. It would have been easy for us to assume he was allergic to rice: he reacted to the processed baby rice cereals, so we gave him cooked rice porridge. He reacted to that. We of course observed these reactions before we figured out the detergent sensitivity, but we initially assumed he was allergic to rice. I wonder how many people do the same thing as we did, and assume their child is allergic to rice after they cook it themselves, not realizing the allergen could have come from whatever the pot was washed with. Detergents get into foods during processing. When I say “processed,” I’m not just talking about foods people usually think of as processed, like Twinkies, but foods people think of as basic, like milk, oil, eggs, bananas, and poultry. If anybody did anything to the food except pick it and bring it to the market, consider it processed for the purposes of this discussion. The more that has to be done to the food to prepare it, especially in the presence of water, the more opportunities to introduce detergents. Infant formulas might have detergents in them, or at least that was our deduction from our experience. We tried virtually every major brand sold in this country, including hypoallergenic ones, and they all caused our son eczema. We could easily have assumed our son was allergic to milk, but that didn’t make sense either, because he was more allergic to yogurt than plain milk — if the problem had been the protein, it should have been the other way around. Yogurt is a more equipment-intensive product and probably has more detergents in it — the yogurt we make ourselves with whole milk from a large local organic dairy does not cause the eczema. We did find one infant formula from Europe that did not cause the eczema, but interestingly some of the other formulations from the same company — with additional ingredients that require washing — did cause it. Many food ingredients are washed, opening avenues for surfactants to end up in the final product. Detergents are used to wash equipment; small-batch, equipment-intensive-produced foods tend to cause breakouts. Plastic containers do not have to be washed, but at some point along the way, metals that become steel cans do. Canned and jarred foods tend to cause problems, though I am not sure whether it is because of how the cans and jars themselves are prepared, or because the contents tend to be wet-processed foods which are generally more of a problem than dry-processed foods. Detergents are among the substances approved for washing produce for canning or freezing, see: http://www.accessdata.fda.gov/scripts/cdrh/cfdocs/cfcfr/CFRSearch.cfm?fr=173.315, 21CFR173.315 Chemicals used in washing or to assist in the peeling of fruits and vegetables. Remember, tiny traces of detergent can cause eczema in susceptible children — traces that would easily remain on food-processing equipment that was regarded as clean. Quaternary ammonium compounds (detergents) are used in sterilizing some food processing equipment after it is cleaned. Although completely removing detergents from diet for any length of time is a tough step, it is worth doing all the way at least once, just to let your child experience completely healed, eczema-free skin. Even if you can’t maintain a detergent-free diet — it is truly tough given our reliance on packaged and processed foods — it is worth doing at least once. When your child is completely clear, you can test foods for detergent reactions the same as you would different food groups on an elimination diet. It will allow you to see which foods are more of a problem than others, and allow you to make better judgment calls later, because it is truly difficult to maintain a completely detergent-free diet. Getting completely clear at least once is also worthwhile because it prepares you for when your child has a major ingestion exposure and needs to go detergent-free for awhile to eliminate a bad breakout. Most importantly, it is a huge psychological relief to be able to see exactly where all the eczema comes from, understand completely how it works, and to see how much control you have over eliminating it. The breakouts from ingested detergents can happen immediately or up to a week after an ingestion. Our pediatric nutritionist told us that four days was usually as long as one needs to watch, and our experience bore that out. Breakouts from ingested detergents last longer than contact rashes — contact rashes can be eliminated easily with a good washing procedure. A single ingestion-related breakout can last up to a week even if no other detergents are ingested. In our experience, ingestion-related exposures can cause eczema anywhere, but there are common spots such as the upper arms, legs, back above the hips, and upper chest. Ingestion-related exposures tend to break out in the same spots, where the skin was last broken out. Thus, if the eczema becomes infected, it can be difficult to eliminate the open spots unless one has the ability to completely eliminate detergents in the diet for awhile. To be honest, this is the one area where most people compromise and live with some eczema. But if all the other steps make a huge difference in the visible eczema, I would recommend trying to go detergent-free with foods for at least two or three weeks, taking care to maintain a balanced diet, of course. Most food manufacturers don’t even think about detergent “contaminations” beyond the rinsing measures they use — I’ve talked to many manufacturers who are so used to thinking of food purity in terms of preservatives, additives, and commonly allergenic food ingredients, that they automatically deny their products could have detergents introduced at any point. I have to usually press people to discuss the processing of each item in detail to get them to think about the issues relevant to this allergy. Often when I explain this allergy to people, they ask if using organic foods solves the problem. Like the manufacturers themselves, they confuse food purity vis-à-vis pesticides with absence of detergents. We do use organic foods for a few reasons. For one, pesticides may be sprayed using surfactants for even coverage. Non-organic foods may be subjected to other processing steps that introduce detergents, for example, one local grocery promises the food is guaranteed washed free of pesticides. Lastly, when one has to make so much food from basic ingredients, it’s better to start with good quality ingredients, and at least where we live, the organic food is usually better. However, “organic” should not be confused with “detergent-free” in regards to processing. Organic food processors have to comply with FDA food processing regulations, and that means washing equipment and raw produce. Do organic standards allow detergents? I can’t say for sure, but based on the requirements and personal experience, I don’t see how they could avoid it. Exceptions are allowable in the CFR and seem to be made for cleaning with synthesized products, since alternatives are not available, although interestingly, the CFR on organic practices currently mentions only the word "soap" and not "detergent" or "surfactant" for cleaning. (More probably they do not define the term with as much specificity, but I have written to ask.) Organic makers are often smaller, and smaller batch processing has the potential for introducing greater amounts of detergents. We’ve had the best luck getting detergent-free processed foods that are made in very large, high-tech facilities, but it is no guarantee. I am currently trying to find a contact in the FDA who can help me navigate the food processing industry to better identify processed foods my son can tolerate. As with so many aspects to this problem, I am still investigating. Foods we’ve had problems with: processed sugar (even brown sugar and ostensibly less-processed crystallized sugars), poultry, egg whites, bananas, ketchup, anything packed in recycled glass, have all been problematic. It’s always possible our son is allergic to those things, but anytime we’ve been able to test that by being absolutely certain no detergents are introduced, he has not had problems. When we’ve made ketchup with homemade concentrated pear sweetener rather than processed sugar, and basic ingredients identical to our store-bought ketchup, our son had no eczema from it, but he’s had a mild reaction to every brand of processed ketchup we’ve tried. Acidic and fatty processed foods seem to be particularly susceptible to collecting detergent residues. As children grow older, their skin becomes naturally less permeable and one would expect them to exhibit less eczema after infancy. The skin of children with detergent-reactive eczema will seem far stronger and healthier in a safe home environment where their skin is not subject to persistent breakouts. Even when children seem less susceptible to eczema breakouts, it is important to maintain these changes. It is important for everyone in the home to make this switch in order to completely eliminate the eczema. To reduce asthma and seasonal allergies, everyone has to make the switch in order to keep detergents out of house dust. I cannot stress this enough. When people contact me after seeing that going detergent-free is making a huge difference but they still have breakout problems, the number one reason they fail to eliminate the eczema is that the whole household did not make the switch. Often, people think they can get away with switching just for the baby — this is a huge amount of work, and makes too little of a difference. Other times, there is a holdout in the household, someone who is just so attached to their personal care products, they figure one little face wash or moisturizer isn't going to matter (it does). Often I find that the holdout is an adult with their own history of eczema or skin problems — people with a history of sensitive skin are understandably reluctant to change. Many of the happiest success stories I hear from adults who resolve their skin problems by going detergent-free come about because they made the switch initially only for a child but didn't switch the whole household — but when they finally did switch the whole household, found their own skin problems resolved, too. Many of the washing products that contain soap on the market today are combination products that have other vegetable-based surfactants in them. Many natural products advocates consider vegetable-based products to be better for the environment than petroleum-based, so these combination vegetable-based surfactant products can be found on the shelves of most natural food stores. They aren’t the same as traditional soap. While some of these combination products may prove okay for this allergy — I don’t know — for the purposes of problem-solving, it’s best to stick with 100% traditional soaps and consider changes once one sees the results of a total switch. Read labels. Traditional soaps are anionic. In recent years, the “natural” product sector has been flooded with products containing nonionic plant-based surfactants. The distinction can usually be found on the ingredients label. Soaps are called soaps or "saponified" oils; nonionic products will be separately listed. Other words such as “cleansers” “surfactants” “liquid laundry cleaner” can be assumed to be something other than soap. Not all of those ingredients are equivalent to detergents, but most of them are. Investigate carefully. It used to be that people differentiated soaps from detergents by the starting ingredients: soaps came from plant and animal fats, detergents from petroleum. Surfactant chemistry has allowed companies to produce surfactants from plant and animal ingredients that could be considered plant- and animal-based detergents. But for justifiable reasons, makers continue to label these products as soap, distinguishing the products by the starting ingredients, rather than by the chemical properties of the end result. It’s not clear that soap/nonionic plant-based surfactant combination products (that are primarily soap) are a problem for this detergent allergy — maybe they are, maybe they aren’t. My guess is that at least some of them aren’t, depending on how they are formulated. If they aren’t, it’s probably for the same reason that the old unscented Dove was not, but again, I am still answering questions. (I use one that isn’t a problem, but it is predominantly soap and the nonionic ingredient is a very minor component.) I would personally avoid products that are made up only of nonionic surfactants at this juncture, even from “natural” ingredients, I would not expect them to be benign with this allergy. Pure soap would probably benefit from being combined with washing soda and/or borax. Some of the soap flake sellers give formulas for making these combinations at home. I recently received email from a mom who cleared up her baby’s eczema using soap products from Vermont Soapworks, www.vermontsoap.com. From my reading of their site, I would guess that the founder of the company has this detergent-reactive eczema; the company appears to make all true soap products made from organic ingredients. Their company rep told me that all of their washing products are true soap made through traditional saponification. I get a number of products from a soap company called Cal Ben Soap Company, www.calbenpuresoap.com, (800) 340-7091. The company that made White King, which used to be sold in grocery stores, recommended Cal Ben when they ceased selling soap flakes. I have had good luck with Cal Ben’s laundry soap powder, lotionized liquid dish soap (both for dishes and surfaces), automatic dishwasher powder, and shampoo. For the purposes of making the initial switch to soaps, I would not recommend their liquid laundry product for the above reasons, but it may be okay. I have not tried it. I find their bar soap to be a bit drying, but not more than Ivory bars, and they’re less drying in my experience than Dr. Bronner’s and other castile soap products I’ve tried. (Except for Dr. Bronner's Baby Mild Unscented bar soap, which is one of the better bar soaps I've tried.) I know many people are very happy with Dr. Bronner’s and other castile soaps, my experience is probably individual. Dri-Pak www.dripak.co.uk made Lux soap flakes, which I understand Unilever stopped selling last year. I thought Lux was still sold in Australia, but that could be wrong. Dri-Pak distributes its soap flakes products in the United States by mail order through MSO Distributing info@msodistributing.com 1.888.508.3496. They sell soap flakes and washing soda. These are the same formula as Lux flakes without the fragrance. Inexpensive home recipes: Although Ivory Snow for the laundry is a detergent product now, as far as I know, the soap bars are still soap. Recently a mom who cleared her teenager’s skin problems by switching to soap gave me some recipes for making laundry liquid and powder with grated soap bars. I have known other people who did this in the past with success. There are links below to laundry and dishwasher product recipes. Permission to reprint the recipes has graciously been granted by Recipezaar.com www.recipezaar.com . Important side note: if you search for these recipes on Recipezaar.com, they come up only under the search word “detergent” and are called “detergent” recipes, even though they are all recipes for non-detergent cleaners. I have used a brand called Sodasan years ago, which I understand from emailing the company is all organic and traditional soap-based. I have a concern about one ingredient in the liquid products, only because I haven’t fully checked it out, but all of Sodasan’s dry products are soap-based or non-detergent. Sodasan makes a chemical softener from zeolite which in my experience is the most gentle and effective chemical softener. Sodasan’s laundry powder is an interesting switch — it says “detergent” on the front even though in the ingredients, it lists true soap, a chemical softener, and washing soda only. I have checked with the company, their product is indeed soap based. Again, ignore the front labels of all washing products, they mean nothing. Sodasan is available on Amazon.com. Ecover and Seventh Generation are heavily marketed as natural products — and I think they are good products — but for the purposes of this sensitivity, most of their products are detergents or combination products. One woman I helped got some email from one of the companies classifying a combination product as a soap product; this is a legitimate distinction because of how soaps and detergents have traditionally been differentiated by their starting ingredients, but it is not a helpful distinction for the purposes of implementing this solution. Be very specific if you make inquiries; be sure that the product is based on traditional anionic soaps. Other types of water conditioners and degreasers, such as baking powder or Borax, are okay. I did not see any soap-only products on either Ecover’s or Seventh Generation’s web sites, but I stand to be corrected. I did see some products, such as the Ecover dishwasher powder, that MAY prove to be okay, but again, I recommend first switching only to all-soap or all-nondetergent products, then experimenting later if you have cleared up all the eczema. I tried an Ecover laundry liquid without success (my son’s skin turned red), and the same thing happened to another woman whose son turned out to have this allergy. At that stage, I did not know about the need for superwashing and do not know how much that played into the reactions. I used to recommend Burt's Bees. They still have many bar soap products, but their shampoos have been evolving and not necessarily in a way that works for the recommendations here. Their shampoo and liquid washing products seem now to be mostly sugar-detergent based. It's hard to know where these products fit on the spectrum, I am keeping them on my radar, but for now, I can't recommend them in the problem-solving phase. One friend suggested I look into Shaklee’s non-detergent line. I called and sent Shaklee some email for further information about whether any of their “non-detergent” products could be considered soaps, but have not yet received an answer. I have recently found a company called Ballard Organics, which appears to make all organic soap products, including an unscented line. Their products would be considered soap for the purposes of this site. Non-detergent dishwasher powder products are not soap products — I'm told that soaps are not a good ingredient for dishwashers. Be certain the dishwasher powder you choose does not contain detergents of any kind, but the other mineral and degreaser ingredients should be fine. See below for links to simple recipes for homemade dishwasher powder. Completely disregard the word “soap” on the front label of all products; the word is used liberally for all kinds of detergent products on the front label — especially dishwashing liquids and hand “soaps” that are really 100% detergents — the information about the chemical content should be more specific on the ingredients list. Do not assume that this is any different for “hypoallergenic”, “natural” or “organic” products — most that I have seen in the health food store in recent years are all-detergent-based. Some of the makers who USED to sell soap products now sell plant-based detergents. Some of these products are appropriately labeled as detergents products, some are called “non-detergent” products, and some are called soap products whether they contain traditional soaps or not. Check ingredients. Sodium lauryl sulfate and sodium laureth sulfate are detergents commonly found even in “natural” products. Pure glycerin soap is probably okay, but be careful of possible added detergent ingredients. Ordinary glycerin has not caused my son problems. Soapmaking is a popular hobby — there are many sites on the internet devoted to soapmaking, which include links to suppliers of true soap ingredients. Most farmers' markets in my area have wonderful true handmade soaps from small farmers and artisans. Watch out for nut oil ingredients and other common, potentially allergenic additives in soap products. Some research suggests that potentially allergic children should not have nut oils even rubbed on their skin because it increases their risk of developing anaphylactic nut allergies. The same may be true of milk, I don’t know. Cal Ben Soap Company sells a book by Debra Lynn Dadd called Nontoxic, Natural, & Earthwise. While I am not endorsing any particular perspective from the book, it is worth taking a look for the lists of soap makers. Unfortunately, the book was published in 1990 and gives mainly addresses and telephone numbers, not web sites. Also unfortunately, many of the makers she recommends have in the interim switched from selling true soap products to selling plant-based detergent products or combination products. However, the book is also useful for general cleaning advice with non-detergent products such as borax, vinegar, etc. Again, because of the developments in plant-based surfactants in recent years, determining that any given product contains traditional soap rather than detergent surfactants can be a big investigation in itself. If you find any products that you are able to determine are soap (with absolute certainty), please send me a link (and any information you were able to find) so that I may add it to my list! I have purposely not listed emollient-type moisturizers. They are probably the longest, most complex discussion of all, and I cannot write about them at this time. The issues tie in with membrane permeability, why certain products cause this problem, and how combinations of different chemicals could change the properties of certain components. The short answer is: once you get rid of all the detergents and detergent dust in your home, and if your child’s skin clears up, you can probably safely use some emollient-type moisturizers. Which ones is an advanced discussion that stretches the boundaries of what I know about this problem and relevant chemistry. Assuming you are pretty sure your child has this detergent allergy — at least until the eczema is cleared up — I would recommend sticking with the barrier-type moisturizers, and using them only after washing detergent residues from the skin for best results. I listed first the ones I have used. I have listed some products I have not used, but that I would be comfortable based on the ingredients to try. Some have been recommended by other people I have helped whose children have this problem. Remember that you are looking to eliminate detergents, but that you also have to be aware of individual sensitivities to ingredients. For more updates, please refer to my blog www.solveeczema.org/eczemablog . I try to be very clear about how people can find their own products locally that work for them. I’ve seen other non-detergent dishwasher products – I’m afraid I don’t have a name offhand — they do not have to be soaps (in fact, I don’t think you want soaps in your dishwasher), but be careful to avoid the detergent-like surfactants. I include these opinions about allergy as something to think about, because I could not have solved our son’s eczema save for this perspective. These are only my theories and opinions, and I reserve the right to be wrong! However, I find this perspective much more compatible with all the research coming out ostensibly in support of the hygiene hypothesis. It certainly better explains the reasons for the rise in eczema and allergy. More importantly, I think this perspective is far more helpful from a problem solving perspective in regards to allergy. When one does not have a satisfactory solution to a problem, and that solution eludes for decades, it is reasonable to question whether it is because the problem is inherently so difficult, or because we are taking the wrong approach. It is my opinion that ordinary allergies (non-life-threatening) are a protective mechanism, the immune system’s way of communicating with the conscious brain, the way the nervous system communicates through pain. “Ordinary” allergens have been shown to be similar (but not identical) to pathogens. The accepted interpretation of this in medicine is that the immune system is defective in some people and becomes confused. I believe that the immune system is not confused, but requires greater energy to differentiate — which is a potential danger to survival in the long-term — and asks us to remove ourselves from the problem in a way that creates some urgency but gives us a choice in the short-term. If the allergen is airborne, we have respiratory symptoms which cease when we remove ourselves from the problem. If the allergen is contact related, the symptoms are skin rash, etc. The symptoms are uncomfortable, but not life-threatening, so we are given time and the choice to remove ourselves from the source. Over the long term, the toll on the immune system from expending the extra energy could be a more serious problem that the immune system is not able to clean up. In this way, allergic symptoms are a protective mechanism, not pathological. They usually do no lasting harm if the conscious brain heeds the warning. Not everyone reacts or reacts the same, because circumstances (internal and external) differ. Allergies can come and go throughout life, again, depending on circumstances. I believe known circumstances in which allergies develop — such as in bottlefed babies more than breastmilk-with-its-antibodies-fed babies — are consistent with this perspective. There are any number of research examples demonstrating how compromised or overloaded immunity can go hand-in-hand with allergy — meaning, the body asks the conscious brain to free up finite energy resources so that it can do important work. Until about 80 years ago — an infinitesimal blip in the timeline of human existence — these messages from the body would have been relatively easy to heed. Since World War II, we’ve added so many new kinds of chemicals without the ability to evaluate them fully before covering the planet with them, while at the same time producing more and more ways to suppress the body’s natural reaction to them.